This post contains affiliate links and is sponsored by Cara Speech Therapy. When children are learning to speak many struggle to produce final consonants as they learn their first words- they may say "uh" instead of "up" or "bo" instead of "boat." This can cause frustration as they try and express themselves and communicate! I am always looking for ways to decrease frustration and increase language development, so I am excited about the activities share in this post! Over the past several weeks I have been working to help my 18 month old acquire new words and articulate final consonants as he talks. We were excited to be introduced to the book Easy-to-Say First Words: A Focus on Final Consonants by Cara Tambellini Danielson, a speech therapist who specializes in pediatric speech and language development. 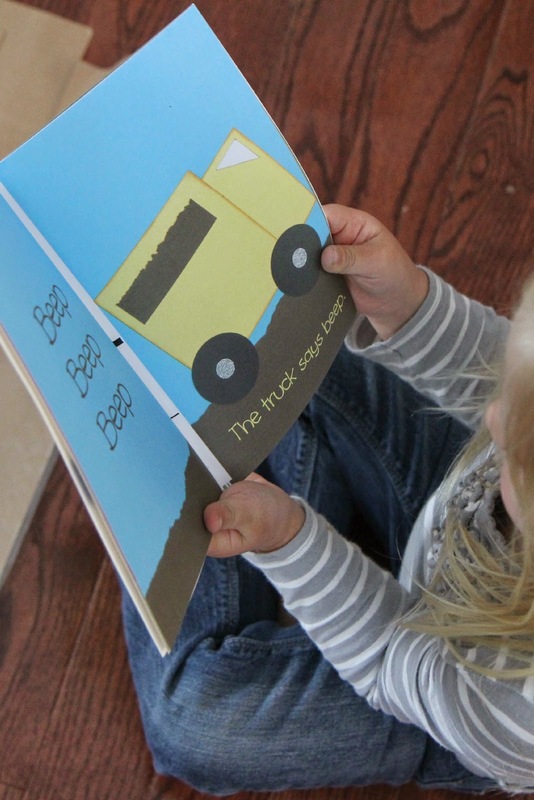 Today we are excited to share a little bit about Cara's book with you AND share some simple book related crafts that focus on first words and final consonants! 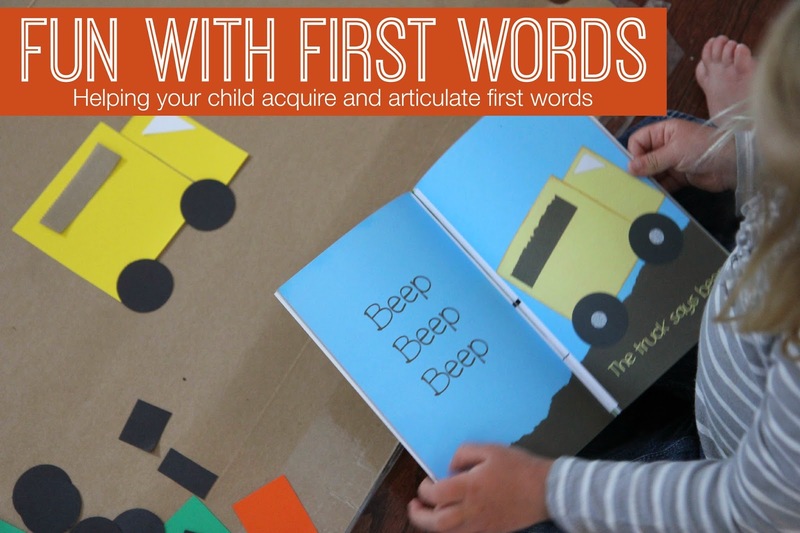 Easy-to-Say First Words: A Focus on Final Consonants is a thin paperback book with darling illustrations and simple language focusing on one-syllable common first words. I think the book featured every single one of my 18 month old's favorite things... so he was in heaven as we read the book together. He loved practicing saying the simple one-syllable words. My 3 year old daughter loved the book too-- especially the pictures and the crazy feathers! In addition to reading the book together, my preschooler and I (along with my toddler's help) created two craft projects focusing on two first words in the book that my toddler loves- duck and beep (he also loves truck too)!! 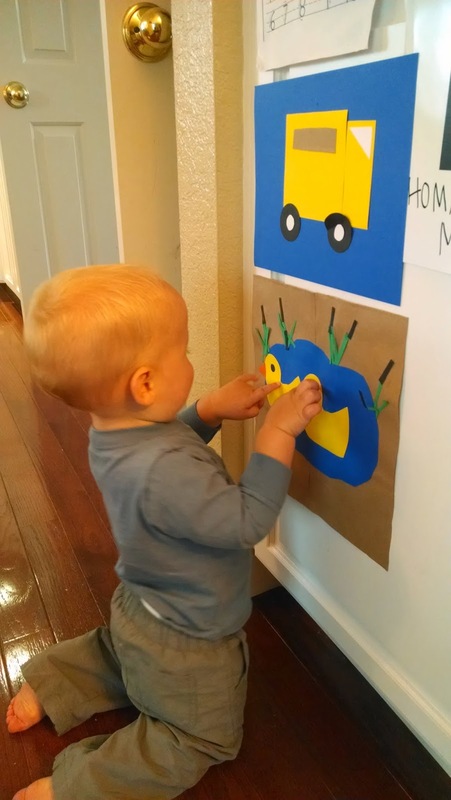 Once our projects were created we hung them at eye level for my toddler. Each day he runs over to the pictures again and again to touch and talk about them. As I mentioned above, the illustrations in Easy-to-Say First Words: A Focus on Final Consonants are really cute! They are created using cut paper and my preschooler noticed them right away. 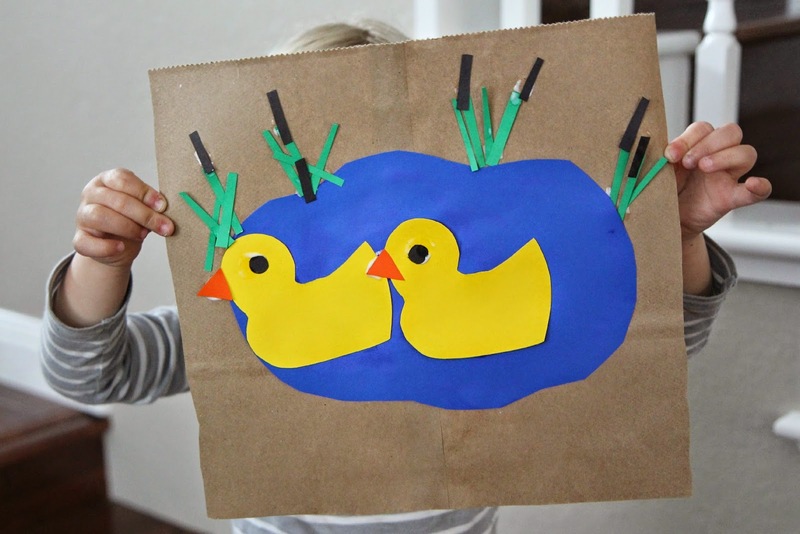 We decided that it would be fun to do our own cut paper duck pond creations inspired by Cara's book. To create this simple scene at the duck pond my preschooler and I cut out all of the pieces and then we assembled them using the duck pond in Cara's book as our inspiration!! I gave my preschooler strips of green and black paper so that she could cut the strips needed for the reeds in the pond while I cut out the ducks, eyes, and beaks. It was fun to work together! In addition to the duck in the book, my kids loved the page with a truck on it! The truck said "beep beep" to help kids practice the final consonant /p/. We also practiced the final consonant /k/ with this one as we repeated "truck" again and again! My daughter asked to do a truck activity, so we built some shape trucks and then also gave them to my toddler as a little gift! For this activity I first cut out several circles, squares, and rectangles in a variety of colors and then my daughter brainstormed which trucks we should make. Since my son loves garbage trucks... that was a must. We also made a big yellow truck like we found in Easy-to-Say First Words: A Focus on Final Consonants. 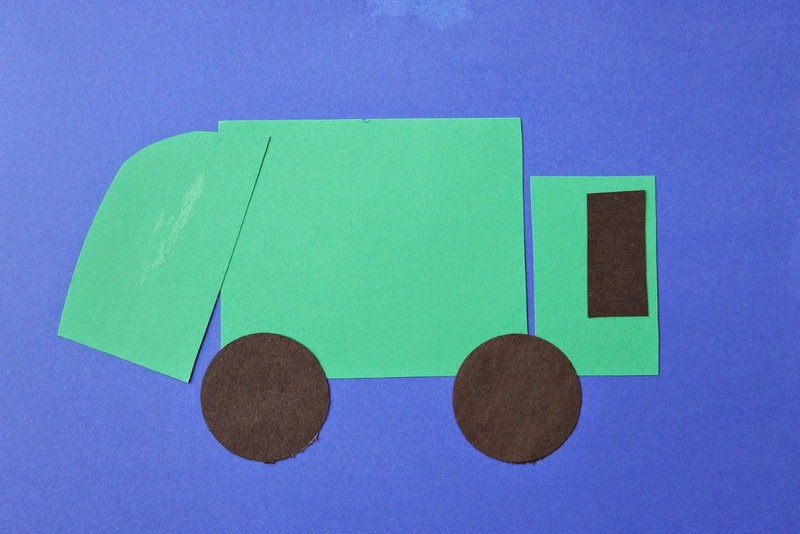 In addition to making our favorite trucks, we also used the materials we'd cut out to create some new types of trucks. This one above was a train truck. My son also loved the trash truck we put together for him. Another highlight of Cara's book is the Parent Guide that goes along with it! I am not trained in speech therapy but taught children with communicate disabilities for many years (alongside a very awesome speech therapist). I am a big fan of resources that help parents know how to help their kids acquire language and become articulate! In the Parent Guide, Cara shares simple things that parents can do with their child while they read her book. The ideas are simple and do-able and are great for helping kids make progress in their language development! I am hoping that Cara decides to make a series of books in the "Easy-to-Say First Words" category featuring different sounds at the beginning, middle, and end of words. I would also love to see Easy-to-Say First Words: A Focus on Final Consonants turned into a simple baby board book that is sturdy and durable for little fingers. Easy-to-Say First Words: A Focus on Final Consonants is available to purchase on Amazon if you are interested in grabbing your own copy or purchasing one for a friend. I find myself grabbing Cara's book again and again throughout the day because the illustrations are so fun to check out and the book is so short and simple. Perfect for my little one's short attention span. I also love how thin it is because I can slip it easily into my purse to bring with us on the go. I am always trying to find ways to entertain my toddler while we wait at activities, so this book has been a lifesaver! Do you have any other favorite ways you have used to help your child acquire first words and articulate final consonants? PS- Don't forget to enter our awesome t-shirt giveaway from BKY Kids!! Only 24 hours left! PPS- If you want to get your kids to listen without nagging, reminding, and yelling, come join us for a FREE parenting webinar next week hosted by Amy McCready at Positive Parenting Solutions! It is going to be fabulous. Space is limited, so register now! Hi Kristina: So clever to have your children make some of the pictures in the book. I'm very glad they enjoyed the art in the book, especially the crazy feathers (my favorite). When my daughter asked my to be the illustrator of the book my only hope was that my artwork would make little children happy. Thank you.